Maybe you’ve heard of birthday clubs. Maybe you’re in a few. 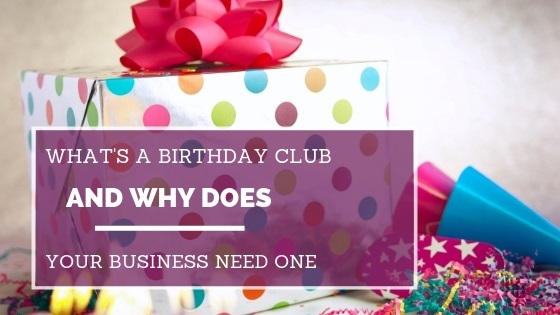 But how exactly can birthday clubs help your business? There are lots of reasons why you’d want to start one. The interesting thing is what they can do for your business. Grab a cuppa and settle in to read all about birthday clubs and why you should start one for your business. So, what exactly is a birthday club? To the outside world, a birthday club is when you join someone’s email list and around the time of your birthday, you get a present. But what is it for your business? It’s a part of your email list. These people are your subscribers and they get regular emails from you with information they find valuable. It’s also a great way for you to show them they are appreciated by sending them a small gift on or around their birthday. What kind of present should I send? Well… you’re only limited by your imagination. My advice here would be to make it something easy for you to share and easy for the recipient to redeem. If you put hurdles in their way, they won’t appreciate it, after all, it’s supposed to be a present. And they should come with no strings attached, right? These are great to offer because they are so simple. It doesn’t have to be masses of money off. In fact, you don’t have to give any money off. How about offering free postage and packaging if they spend over a certain amount? Or perhaps you could offer next-day delivery as standard. Once you’ve decided what to offer, make it easy for people to get. One way you can do this is by using trackable coupons right in the email you send out. My favourite tool, Constant Contact, does this and makes it so easy for you to keep tabs on who took up your offer. I was talking to my husband about convenience stores and how you use them only when you’ve run out of something. But what if you sent out an email around people’s birthdays offering them a free bar of chocolate? All they have to do is come in and collect it. This would be a great way to get people into your shop and give them the feelgood factor. Do you have eBooks you’ve written and sell? How about sending one of those out to people on their birthdays for free? 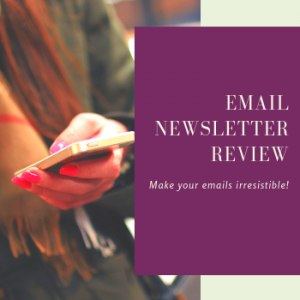 It’s a great way to get your work in front of your subscribers and to entice them to look at what else you have on offer. Make sure you tell people the value of the eBook you send them, so they understand what they’re getting for their birthday. If, like me, you’re a mentor or coach, giving some of your time to your subscribers is a great present. They get to learn from your experience, and you get to show them how you can help them. So, set up a club where people can get 30 minutes from you to discuss a challenge they need help with. You’ll need to do a bit of upfront work with this one, such as figuring out how people can book you without fuss. I use Calendly for this, which gives people options when I’m free and they choose what works for them. As I get older (and I’m going to be 50 this month; more to come on that very soon), the thing I appreciate is getting birthday cards. Now, mine come through the post, but there’s no reason why you can’t send electronic ones. Of course, that’s more environmentally friendly and will save you time. But the simple act of someone knowing and remembering your birthday goes a long way to making people feel special. Why should I set up a birthday club? There are so many reasons why! You can tell people that when they join your email list, they have the chance to join your birthday club and get a present from you on their birthday. You should make it optional for people to give you their birthday. But I’ll tell you this: I’ve never withheld mine when I’ve known I’ll get a present. Think about how you feel when you get a present you weren’t expecting. Yes, you’re asking people for their birthdays and telling them you’ll send them something. But we have short memories. I’m in a couple of birthday clubs, and every year I’m surprised when I get an email with my present in it. That kind of goodwill goes a long way. You own a small business. You’re potentially the only one in your business. Why wouldn’t you act like a person and show your personality and character? For me, this is the one advantage we have over big businesses, and we should embrace it. I’ve already talked about the convenience store example. Giving people a present encourages them to buy from you. Especially if you offer them a money off or a freebie. It’s a way to get your subscribers to your website or your shop and parting with some cash. Decide what your present will be. Make sure it’s something you can afford to give and have the capacity to fulfil. Change your email sign-up boxes to include a field to collect people’s birthdays. Remember, you only need the date and the month – no more than that. Also, make it optional to fill in. Ask your current subscribers to join your club. Send a short survey asking for their birthdays. Make sure you explain why you’re asking, and, again, make it optional. Set up your birthday club email automation. This will automatically send out emails on or around people’s birthdays. Et voila! Your birthday club is up and running and you can create joy and happiness for your subscribers. Birthday clubs are only one thing you can do with email automation. If you want to know how else you can use it, join me on my webinar on 25 April. I’m going to share a whole lot of information which I know you’re going to love. Save your place today.